Today's regularly scheduled shoe-drool has been interrupted by this gorgeous letterpress card by Parrott Design Studio, whose Etsy shop is chock full of pretty paper. Tell me, did you send Valentines this year? I mailed Rifle Paper Co.'s darling postcards to far-flung friends and family and will be handing out Paper Source's mustachioed gentlemen around the office today, but I like to think that this card is for each of you–Happy Valentine's Day! happy v-day! I'm sure your rifle valentine's were gorgeous. You have such a beautiful heart. I'm only having a picnic with Miss Emma today and hoping it would stop raining soon so that we don't get our bottoms wet at the beach. i wish i worked with you!!! Happy Valentine's Day! Happy Valentine's Day Lena. Love those cards! That is so sweet that you handed out cards old school style. You are awesome and so thoughtful. Happy Valentine's Day! May it be lovely!! Happy Valentine's Day Lena - wishing you a sweet one! I'm handing out a few and mailed some others, went with a macaron theme this year :) Love everything Rifle, sigh. Oh, those are divine! I made Valentine's for Little Dude to give away to his teachers, friends, and to mail to family. I was accidentally quite crafty! Happy V Day to you and yours! Haha well thank you for this beautiful card :-) Happy Valentine's Day! Happy Valentine's Day to you lovely! I love this! Going to check that etsy shop. Thanks for sharing! happy love day darling! i love all the rifle paper co's cards :) such amazing illustrations, i always want to frame them! That card is gorgeous. I feel really bad because I sent no one nothing. Bad form on my part. Happy Happy Day Miss Lena!! So fun to see Sarah's work here! We're lucky that her sister has a bakery in town where her cards are also on sale! lovely calligraphy! i made valentines not only for my fiance but for his family too whose house we're temporarily crashing at. valentines is about spreading love to everyone! 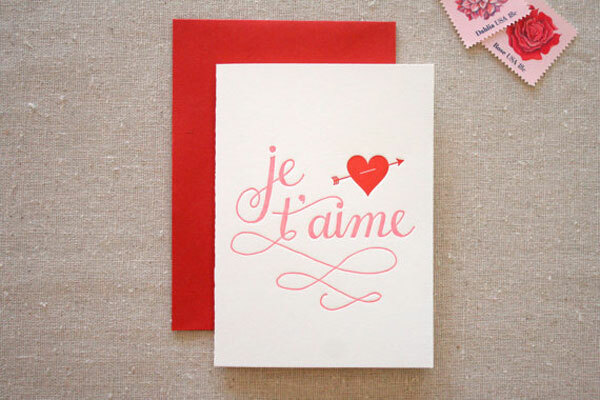 Valentine's day was made for letter press cards! I just love the look and feel of them. It is so nice to have access to such great papers these days! What a perfect little Valentine! Hope you had a great one sweetheart!